Friday Night Lights was a much-loved TV drama about lives of a football coach and his players in West Texas. It ended its run last year with an Emmy for lead actor Kyle Chandler, who played Coach Taylor, the stoic lead coach of the high school football team. Just as key to the show's success was the high school's lead booster, Buddy Garrity, played by Brad Leland with comic genius. He was the Falstaff to Coach's Hal: a man of big appetites, gregarious warmth, resourceful and just a touch iffy in the morals department. 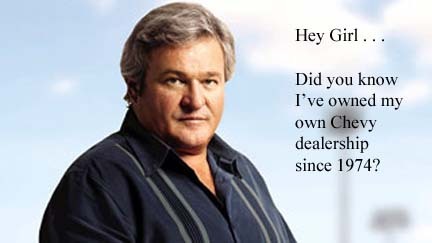 Yesterday as my friend mused about writing some Buddy Garrity fan fic, I wondered what a "Hey Girl" series of posters would be like if they featured Buddy instead of Ryan Gosling.